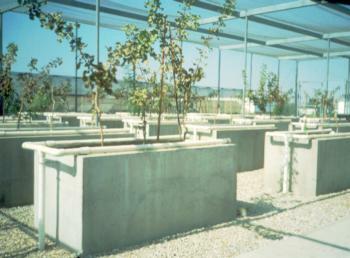 The goal of the tank studies, initiated in 1999, is to evaluate the growth, potential ion toxicity and ion relations pistachio budded on three commercial rootstocks under high salt and boron stress. Saline-sodic drainage waters in the San Joaquin Valley are dominated by sulfate and often contain high concentrations of boron in addition to increased salts. The ability to tolerate soil and water supplies with high salt and boron content creates a niche for pistachio production in areas where other tree crops cannot thrive. However, pistachio can still be adversely impacted by these conditions and little information exists on the interaction of these stresses on pistachio. Detailed information on the performance of pistachio when exposed to high salt and boron stress is critical in the management of this crop as it is developed commercially in these marginal areas. The principal commercial pistachio cultivar, Pistachio vera, is seldom grown on its own roots. A rootstock species is field-planted and P. vera is the scion, or fruit-bearing portion, which is grafted during the first field season. In California Pistachio vera, is typically grafted onto one of three major rootstocks: P. atlantica, P integerrina, and a hybrid of the two called 'UCB-1'. The P. vera scion cultivar 'Kerman' budded on these three rootstocks were evaluated in these studies.